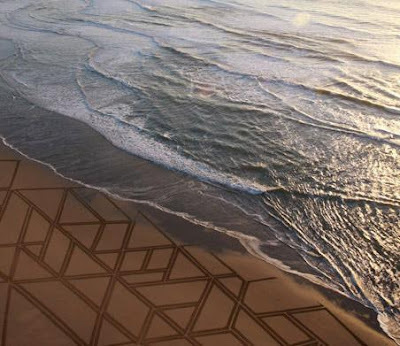 Geometry, fractals, and growth are a few of the inspirations that artist, surfer, and chef Jim Denevan's relies on to create his ephemeral lines in the sand that engage his mind, body, and spirit. Whether he is creating earth art or his next outdoor dinner event, Denevan strives to tred lightly on the planet. Look for Denevan's work on beaches and deserts from Santa Cruz to Seattle.